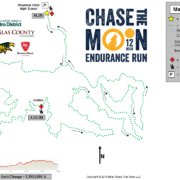 Chase the Moon – 12-Hour trail team relay and solo ultramarathon, to be run overnight, under the light of the full moon. 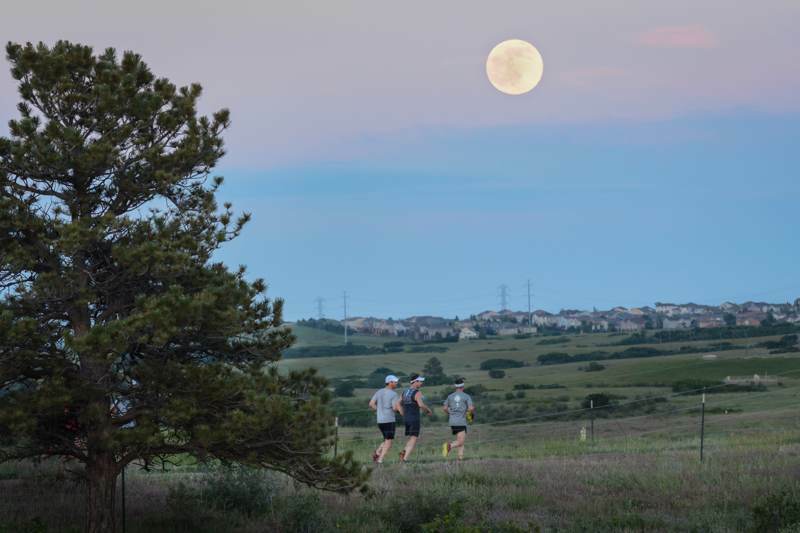 Chase the Moon is a 12-hour team relay and solo ultramarathon, run overnight under the light of the full moon in the Highlands Ranch Backcountry trail system (we promise some of the best views of the metro and front range). 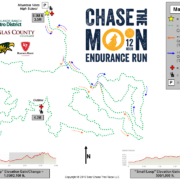 Run as a solo ultrarunner, or get your fellow moon chasing friends for a 3-person or 5-person relay team. 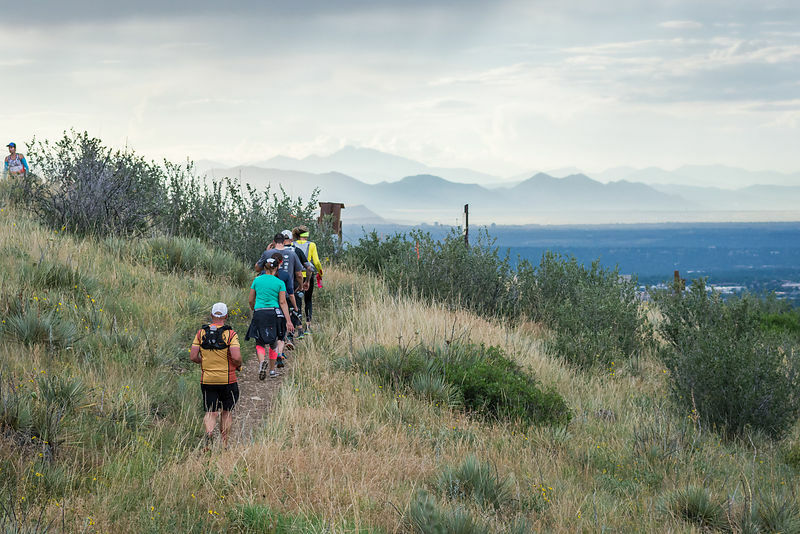 Chase the Moon begins at 7 p.m. on Friday during a beautiful Rocky Mountain sunset, continues through the night beneath the illumination of the full moon, and finishes at 7 a.m. on Saturday as the sun rises in the east to paint the foothills with alpenglow. Don’t miss this unique and incredible running experience. 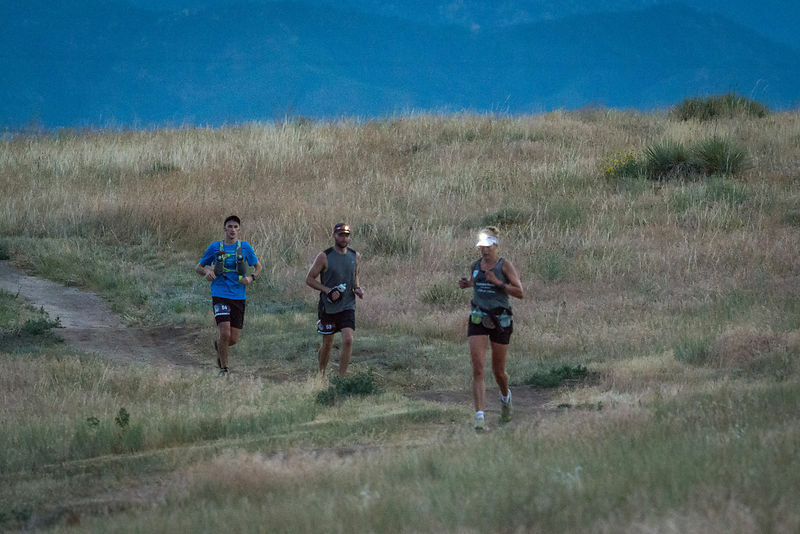 Are you up for the Runners Roost 100-Mile Challenge? A special challenge just for our 3-person relay division; if the 1st Place, 3-person team breaks 100 miles total for the 12-hour race, they will receive a $500 cash prize! 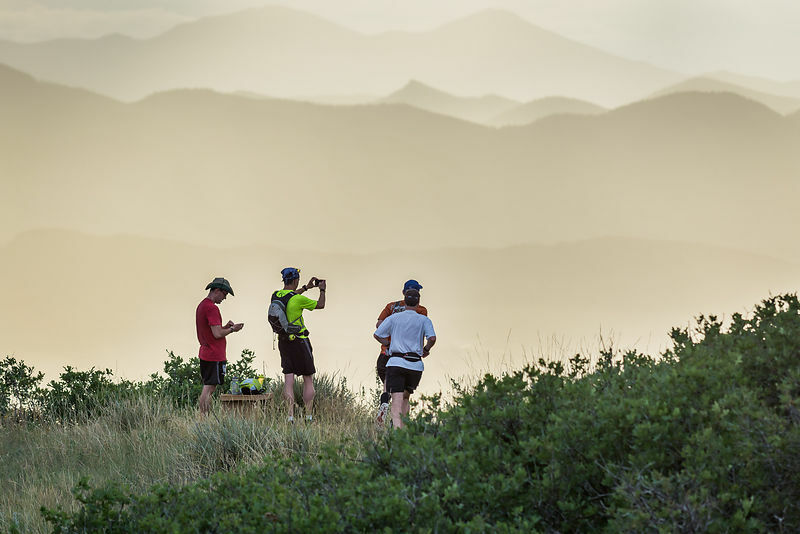 Runners will follow a beautiful, rolling race course in the Highlands Ranch Backcountry Wilderness area. The 10.3 mile loop is 98% dirt trails with approx. 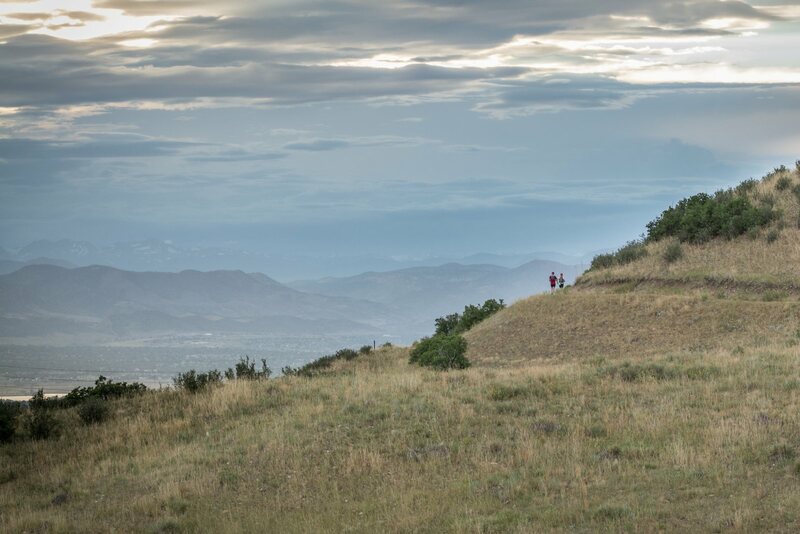 1,300 feet of elevation gain per lap, minimal technical difficulty, and wide-open and exposed views… Perfect for a race at night! 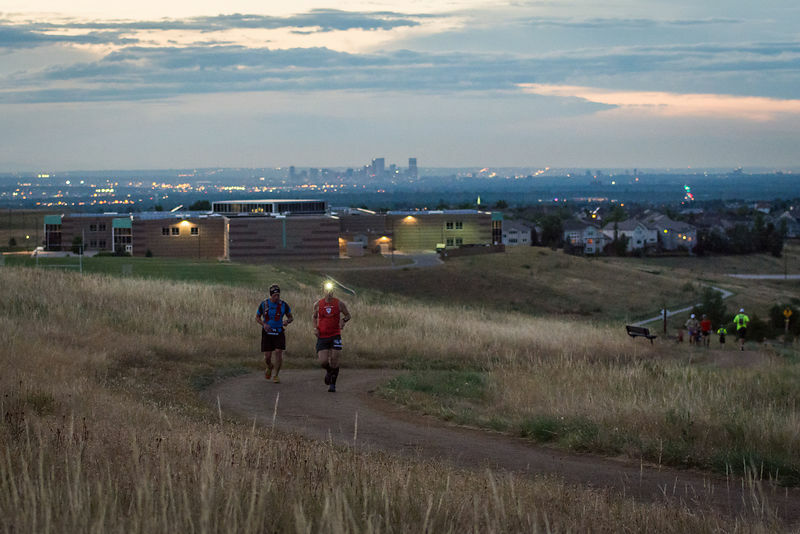 The race will begin under a Rocky Mountain sunset, continue throughout the night beneath the illumination of the full moon, and finish as the sun rises again in the east to paint the foothills with alpenglow. Runners will switch directions each lap, (“washing-machine” style), with odd-number laps run counterclockwise and even-number laps run clockwise. The race course will be well-marked with flags, flagging, reflective tape, signs, glowsticks and flour. All runners will also be required to run with a headlamp (or handheld light source), during the race. Solo runners and 3-person relay teams will run the entire 10.3 mile course. 5-person relay teams will run on the same course, broken up into an 8.5 mile “big” loop (odd laps) and a 3.5 mile “small” loop (even laps). 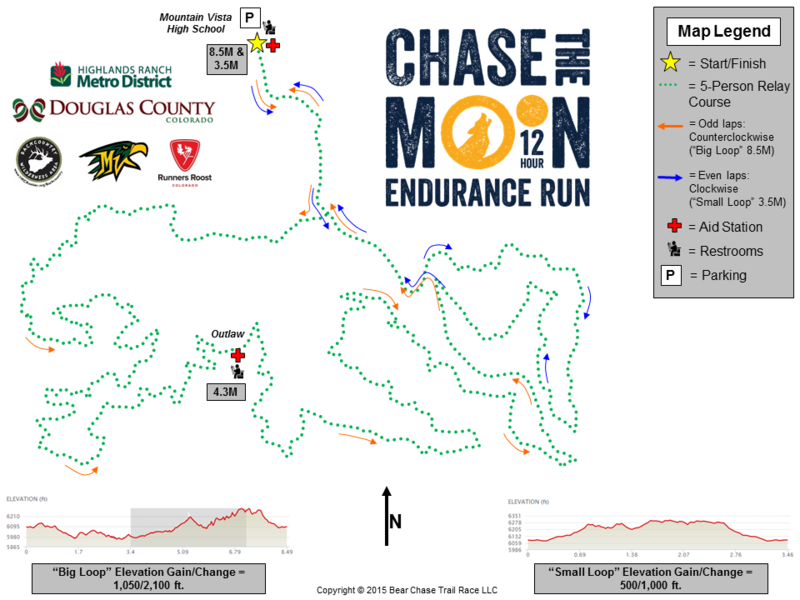 The race course will be well supported with two aid stations; Outlaw & Start/Finish. Both will stocked with a full assortment of drink and food. Drink options will include water, sports/electrolyte drink, soda, and coffee. Food options will include cookies, pretzels, chips/crackers, pickles, M&Ms, Skittles, PB&J sandwiches, ramen noodles & pancakes (Start/Finish only), bean & tortilla rolls, bananas, watermelon, and oranges as well as energy gels and chews. The race will be run “washing-machine” style, with runners alternating directions each lap. Odd numbered laps (1, 3, 5, etc.) will be run counterclockwise on the race course, and even numbered laps (2, 4, 6, etc.) will be run clockwise. Runners may not receive crew support from anywhere else on course other than the Start/Finish, nor is pacing allowed. Solo runners may opt to run continuously (non-stop), or take an extended break in between laps. All relay exchanges will be made at the Start/Finish. No exchanges are allowed anywhere else on course. Runners may not receive crew support from teammates anywhere else on course other than the Start/Finish, nor is pacing allowed. 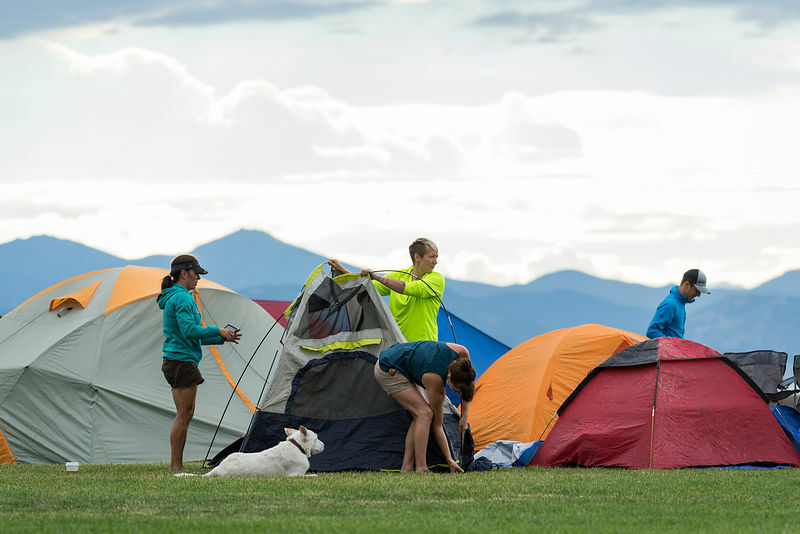 Total mileage for all runners & teams will be calculated by the number of laps they complete during the 12-hour period, and as the race nears 7:00am, several cutdown points will be used. Starting at 5:00am, runners will not be allowed to start another full lap from the Start/Finish, and will be directed to run the 3.5-mile “small” loop of the race course in a clockwise direction, marked by blue flagging. At 5:50am, runners still out on the course will not be allowed to proceed past the Outlaw aid station. Their race will be over and their final race results will reflect their total distance/time to that point, and runners will be directed back to the Start/Finish via the maintenance road (1 mile). At 6:15am, runners will not be allowed to start another “small” loop, and their race will be done. Runners who are still out on the course (either on the “small loop” or past Outlaw), will be allowed to complete their lap, but MUST finish before 7:00am to receive credit for that completed lap. Runners crossing the Start/Finishing line after 7:00am will not be credited for the final lap! How will you chase the moon? 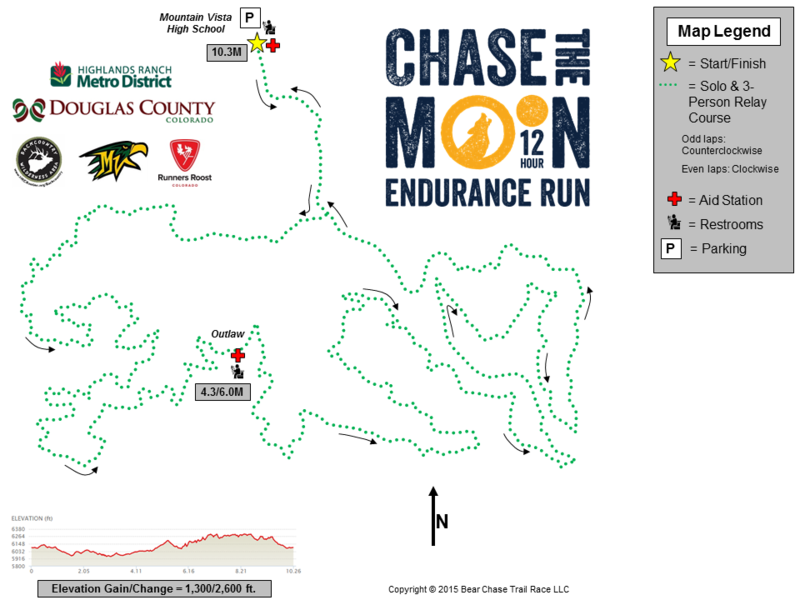 Chase the Moon has been voted by Competitor Magazine’s “Best Of” list in 2014 and 2015 for best race shirt in the country! Medals for Relay participants and 50K / 50M Ultra finishers. Awesome belt buckles for 100K Ultra finishers.